Papillon Bleu UK: 3rd of January:It's my B day. I've changed a few things with the blog, found a new background, added a few new links, redesigned a bit of this and a bit of that.I chose green for the background because green is one of my favourite colours (In France, we say that it is the colour of hope ). Time for a few changes now that 2010 is here and today ... today... is the day when I change... my age...well, some people do it in April or July, and I chose to do it in January.First thing when the new year comes otherwise I forget.There are so many things that have to be done during the year! First thing I showed to the world was my baby bottom! I thought it would be a nice surprise and a joke to start my brand new life.But my poor mum didn't take time to laugh. 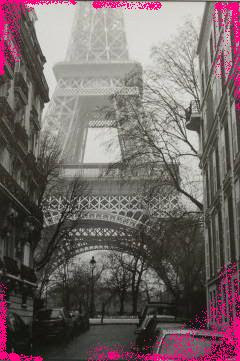 I was born in Paris because I thought it seemed a nice place to come into the world. From up there, I saw quite a few unpleasant ones believe me. You would never dream of setting a foot there. Unfortunately, I wasn't really a city girl...and fortunately, my parents decided to move to the countryside. So we went there when I was 6 and a half. It is called Le Château de Noizé. I think I spent the most beautiful times of my childhood there! I was a little girl in the middle of nature in a magical surrounding. And with a big imagination like mine I imagined I owned the place and that I was a real princess. 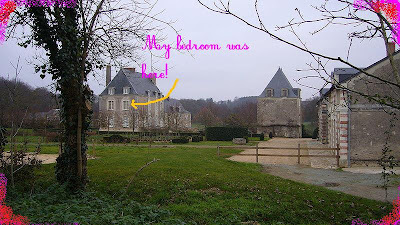 Don't think my parents are aristocrats or something...not at all, they had an arrangement with the landlord of the manor at the time, but this I couldn't care less, because this place was MINE!We left when I was 11 when a little sister came to the world (head first). I still dream about the manor sometimes. Maybe they think there is a ghost who wanders in the corridors and plays in the stairs, but no...it is only me who floats from time to time to the good moments of my childhood. Well, this was a long long long time ago...from the outside I look like a boring adult, but inside I am still the little girl who use to run in the fields with her dog, climb in trees and imagine lots and lots of stories. My head is high up in the clouds but don't worry, my feet are firmly on the ground. 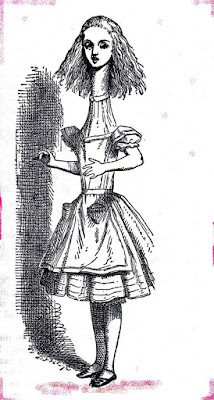 See, a bit like Alice in this illustration by Sir John Tenniel. Well you see, there are far many more things I could have told you about me, but today, this is how I want to be. Am just a spirit in my little Wonderland here down on this Earth. And you know what? It is so good to have you here with me. Happy, happy birthday. May you ever and always play in the fields with your dog , climb the trees and imagine many stories! Even if you are MUCH older than you are now on the outside. It is good that your head is in the clouds, and your feet are firmly on the ground, I hope it always stays that way. But I also hope that your days are filled with many blue butterflies,and in the most unexpected places! May they cheer you up on the dullest and saddest of days. May the flutter of their wings be music to your ears. Run with them in the sunshine and they'll show you where the blossoms are. ps And just remember, as a baby you could be forgiven for showing this world your bottom first...BUT if you do that NOW, you are going to be in BIG trouble! Est-ce toi sur la photo? so cute baby ..... Je le sérum reste en français: J'ai bien aimé ton texte ... ICI Vit Une 2eme Alice aux Pays des Merveilles ... Qu'en ce moment, c'est bien plutot Alice au pays des horreurs (boulot) ... Enfin, heureusement que je n'habite pas pres de chez toi sur Serait Toujours en train de délirer Une poupée à la main! Ce telllllement Serait BIEN!! You are sooo lovely, Pat!! Joyeux Anniversaire ! Plein de bonnes choses pour toi. Bravo pour ton texte, j'aime ton style et ce que tu y dis. Je comprends pourquoi tu es une princesse, quelle merveilleuse enfance tu as dû avoir dans ce lieu, parfait pour l'imagination et rêver. Au fait c'est où Noizé ? Ton choix de fond pour ton blog est parfait. Hope that you are having a lovely day. Happy Birthday Patricia, what a wonderful place to spend your childhood. May your inner child never go away. Birthday Hugs, Juliet. What a wonderful place to have lived in as a child, how lucky you were! Thank you for sharing your happy, magical, beautiful world with us, it's a real joy to visit your blog. Liberty says 'bonjour' - her favourite French word and sends you a birthday kiss! I know I didn't have time to contact everybody personaly but this year was one of my best birthdays ever. I've had a wonderful day with people I love, I've had a call from a blog friend, a wonderful birthday party and all your beautiful words. Happy Birthday, Patricia! I'm so glad you have had a lovely day. Thank you for taking us along on your visit to your childhood--delightful. AND your blog looks great! Happy birthday dear, dear Pappillon Bleu,"angel soul"! ~Let me begin by "giving you a big, warm, embracing hug and kiss" to reaffirm your place in the world my dear friend!~ In fact, not realizing it was your birthday as I was reading one of several comments, (from the post I created last night in the wee hours), I skipped any sequence of order in responding and came to you first! I cannot explain it, other than I was flooded with the emotion of wanting to give you a big hug and a kiss!! I think that is so cool, because then I immediately knew why; it is your birthday and I was meant to greet you and send some heartfelt love your way! Although I must also say, this post has moved me to tears with it's exquisite beauty!~ How utterly beautiful, fanciful and entrancingly "childlike"; in the best whimsical sence of the word,is your creative soul is my dear!~ How well I can imagine you in that beautiful home as child, with in the garden to play in , with your little dog, the birdsong and all those "Papillon bleu"! I loved your last vidoe also by the way, (and although I mentioned it before), nonetheless I wanted to tell you once more it was a "gift" from you are to all of us, with your rare, whimsical, magical, creations and fanciful outlook on life~ Wow! Long may you continue to grace us with your beautiful dreams and loveliness; have a splendid New Year in 2010 Patricia! Sorry I missed your birthday yesterday - didn't check the blogs! I hope it was a good birthday and that you enjoyed cake with your dolls. And I'm so pleased that you haven't given up being a child inside - the world is a better place when we think as children rather than boring old adults. Belated happy birthday wishes. You grew up in a chateau! Wow! Beautiful buildings. Happy belated birthday!! !